Welcome back to my third Halloween-themed post! Until last October, my only experience with Shirley Jackson had been listening to The Lottery what felt like a few dozen times in high school. While enjoyable, it wasn’t the same as experiencing her first hand, so I selected We Have Always Lived in the Castle as part of last year’s Halloween series. (Read my review here.) After a positive experience last year, I chose The Haunting of Hill House this year. No live organism can continue for long to exist sanely under conditions of absolute reality; even larks and katydids are supposed, by some, to dream. Hill House, not sane, stood my itself against its hills, holding darkness within; it had stood so for eighty years and might stand for eighty more. Within, walls continued upright, bricks met neatly, floors were firm, and doors were sensibly shut; silence lay steadily against the wood and stone of Hill House, and whatever walked there, walked alone. 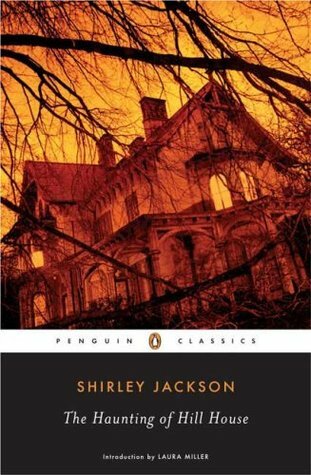 With The Haunting of Hill House, Jackson brought her patented almost-normal-but-still-not-quite-right characters in a realistic setting with paranormal or occult occurrences and influences. Like We Have Always Lived in the Castle’s Merricat Blackwood, Eleanor Vance, who would become a very short-term resident of Hill House, exhibits stunted emotions and thought processes and a paranoid affect. We experience some of her disturbing and insecure inner monologue, which still doesn’t even foreshadow how the book would end. Perhaps it has us now, this house, perhaps it will not let us go. Overall, I found The Haunting of Hill House to be an excellent Halloween read. Like my other top-choice Halloween reads, this book isn’t terrifying, but it presents just enough suspense and just enough of the paranormal that it kept my interest and maintained a gradually building sense of dread. I love Jackson’s complex sentences and how she successfully pairs them with simple sentences that pack a strong punch. Overall, though, while technically strong, there were parts of her writing and the story that didn’t quite click for me. Despite the brief week they spent together, Jackson’s characters developed a unique relationship. Their unusual dialogue added to the overall impact of the book—it almost seemed that as a reader I was somehow a member of the group in Hill House due to an initiation of sorts with the dialogue. While the book only spanned one week of time, it seemed that the group had been at Hill House for much longer—quite possibly what Jackson wanted the reader to feel. The plot was well structured; however, it seemed to squeeze the main action points too close to the end of the book. They almost felt rushed. Again, Jackson tells a fantastic, suspenseful tale using her trademark realistic setting, slightly offbeat if not cognitively and emotionally stunted characters. Have you read The Haunting of Hill House? What did you think? This entry was posted in books and tagged gothic, Halloween reads, literary fiction, Shirley Jackson, suspense. Bookmark the permalink.